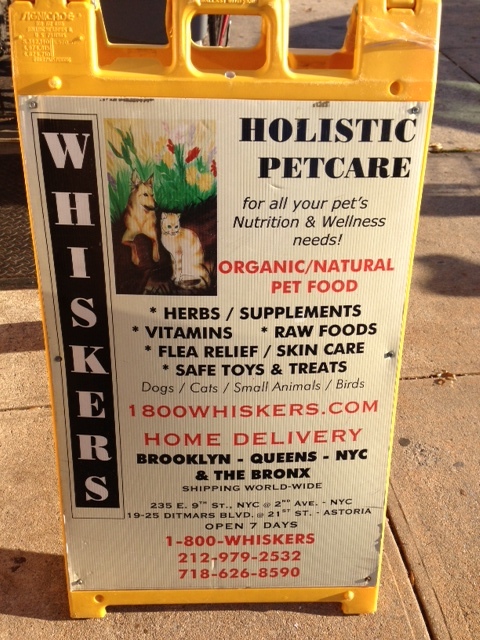 Whiskers Holistic Pet Care is much more than a quirky pet store. 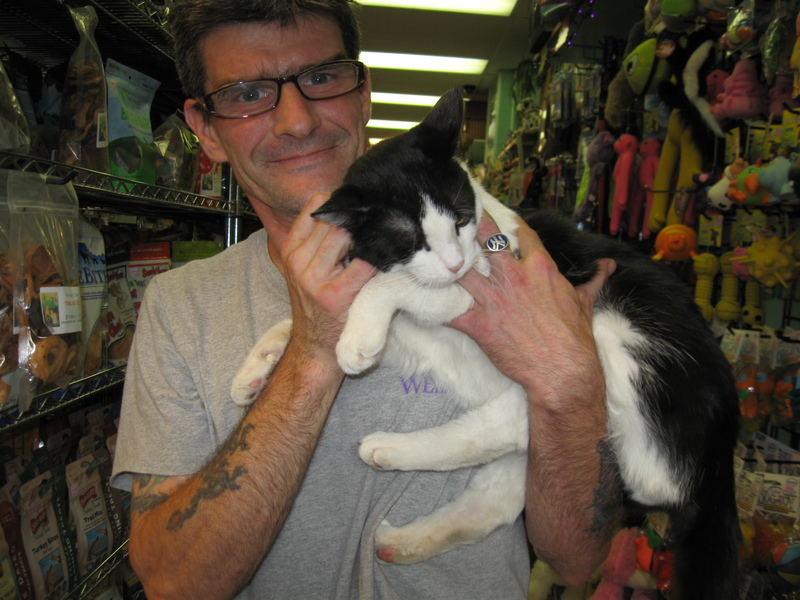 The latest cat for adoption in our Astoria store is Gideon, a social character if ever there was one. He sits at the door of Whiskers Rescue Ranch to view the action, and sweetly meows that he would like to come out and talk! An absolutely cuddly cat, he’s very responsive to staff or strangers, and clearly loves people. He is not from the aloof cat circle, and is quite warm and curious to get to know new visitors, get a scratch, and settle in someone’s arms. 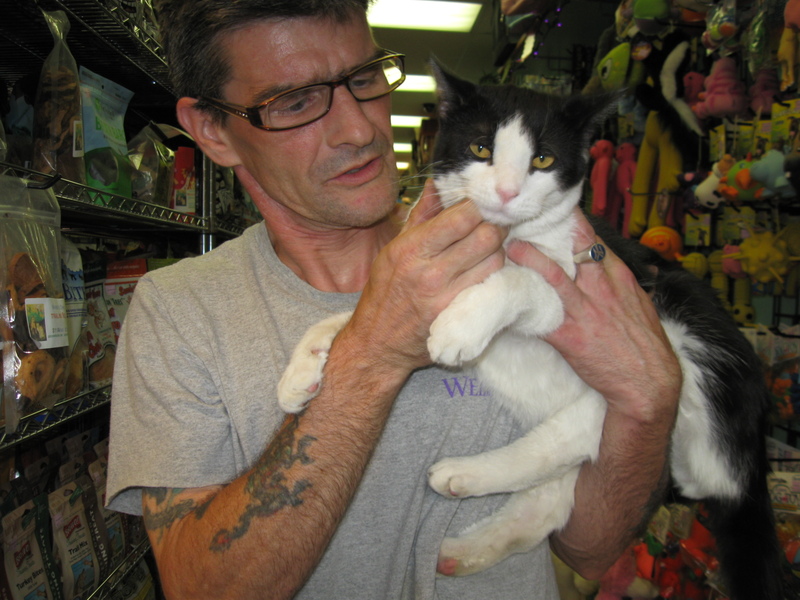 When he came to Whiskers, he had an eye infection that we took care of with veterinary care, and he’s just fine now. He’s about one-year-old and neutered, just about the most affectionate cat we’ve ever met in this species. He is definitely not a loner, but does stretch out to take a good nap in the lazy sunny afternoons. Tommy, a staff member, gives Gideon a nice scratch. However, he is not a fan of the canine sect. In fact, when a dog enters the store, he’ll jump on the highest ramp in the ranch, with hairs on end, hissing at the intruder to let him know just what kind of threat he can be. So, no dogs in a home for Gideon! If interested in adopting him, please call us at 718-626-8590 or come in and meet him. Tell friends! 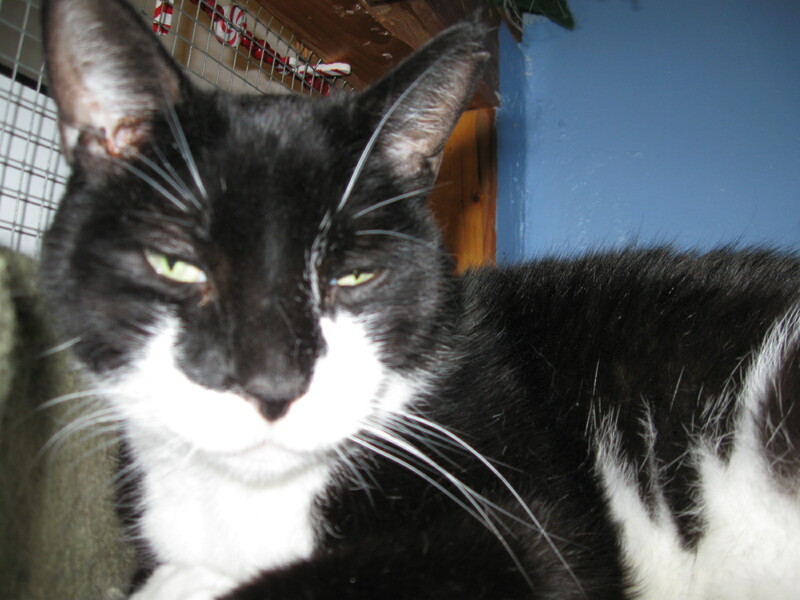 He is a really happy cat, and as much as we all love having him around, we hope to find him the happy home he deserves. Mr. Grey is so handsome, he will take your breath away. The Adonis of the moment, Mr. Grey finds himself in Whiskers Rescue Ranch, solo. Anastasia, the ingénue cat he met by chance, has flown the coop, so to speak, and has been adopted before he could blink an emerald eye. Now he awaits the right one to come along and take him home. 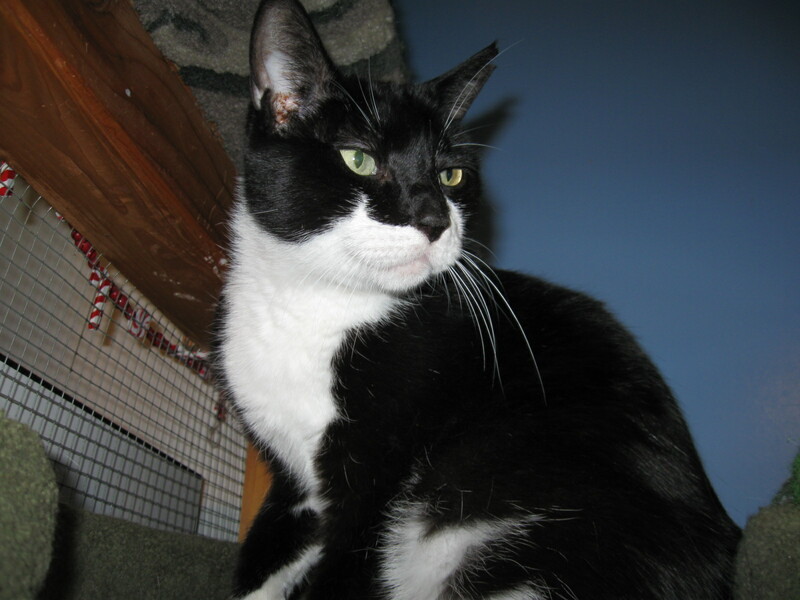 “The Ranch is okay, a little homey for my tastes,” says the attractive and confident one-year-old black-and-white cat. “I prefer modern architecture, you know, the whole stone, steel, glass and white leather look. A view is nice. I lost my funds in a Ponzi scheme, and have no choice in décor here,” he rationalizes. “I would hope that whoever rescues me from the Ranch shares my sense of design. The food, while not Per Se http://perseny.com/ is tasty, and the service is timely. I’ve inferred that adding truffle oil improves everything but who’s going to listen to a cat in reduced circumstances? Mr. Grey will wake right up for treats, and a nice stroke on the back. Large and lovely, he has a permanent Cheshire Cat smile on his beautiful face. He will make a wonderful companion to a devoted cat lover, especially one who likes books http://www.amazon.com/Fifty-Shades-Grey-Book-Trilogy/dp/0345803485/ref=sr_1_1?ie=UTF8&qid=1338922272&sr=8-1. And, as he harmonically shared the Ranch space with Anastasia, Mr. Grey more than likely will fit into a home with other cats already there. Of course…Anastasia brought a gleam to his eye…. Mr. Grey likes the view from high up in the Ranch. Come meet Mr. Grey – he’s in our window at Whiskers Holistic Pet Care, 235 East 9th Street btwn 2nd and 3rd Avenues, in New York’s East Village. Please come right in and ask about adopting him. Or call us at 212-979-5732 – and leave a message with a phone number to reach you back. Just remember, Mr. Grey likes to be in control. 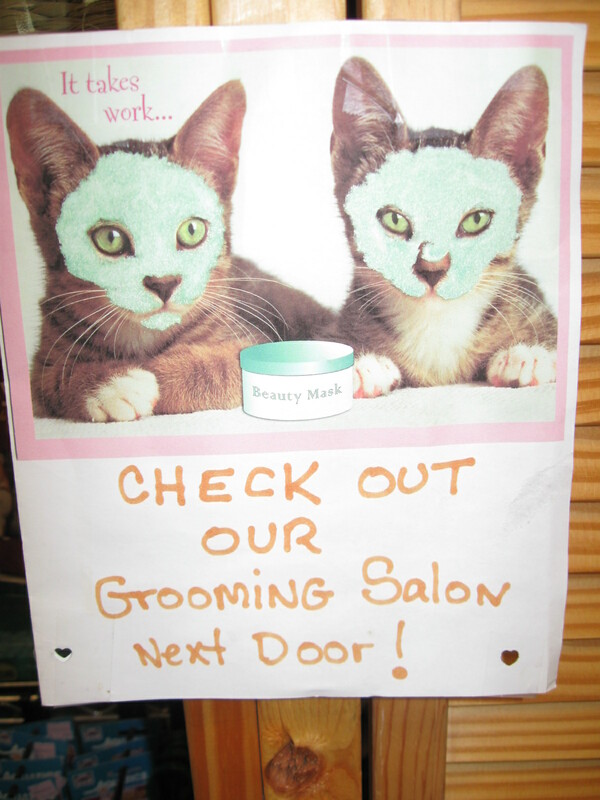 We think this is very funny artwork advertising Whiskers award-winning Natural Pet Grooming Parlor in Astoria, next to the Astoria branch of Whiskers Holistic. Yes, our groomers take care of pussycats, too! Chemical-free products, cageless waiting, and named Best of Queens by the Queens Courier, 2012. 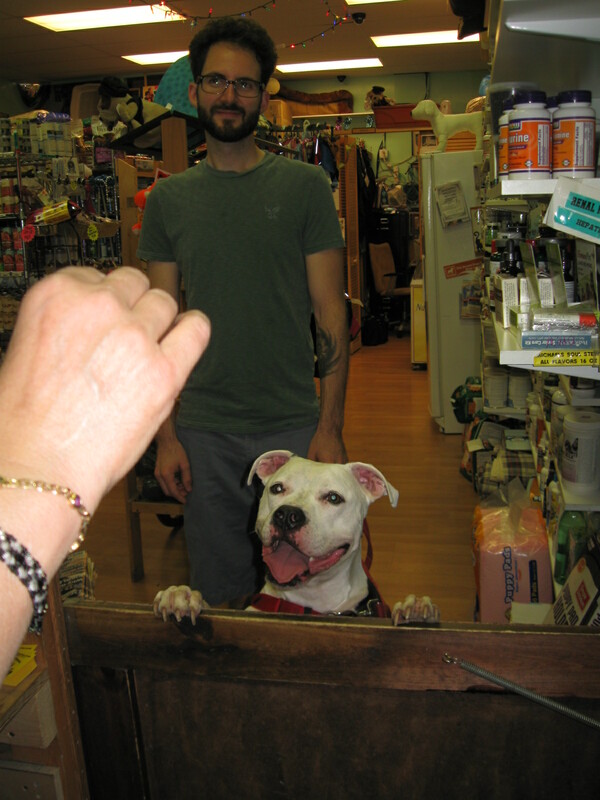 Apollo, a great big hunk ‘a love in a pit bull rescue, waits for the good stuff when he walks into Whiskers after a romp in Astoria Park. Then he goes for a slurpy drinka water, and man! What a great way to start the day! That’s Jon, his person, in the background. Whiskers 19-25 Ditmars Boulevard, at 21st Street. Opens at Noon, bring the beast!